File March 3, 1954: The 1954 Northeastern Indiana Automobile Show at Memorial Coliseum featured a variety show. On the first night of the hour-long show, the audience had to stand. 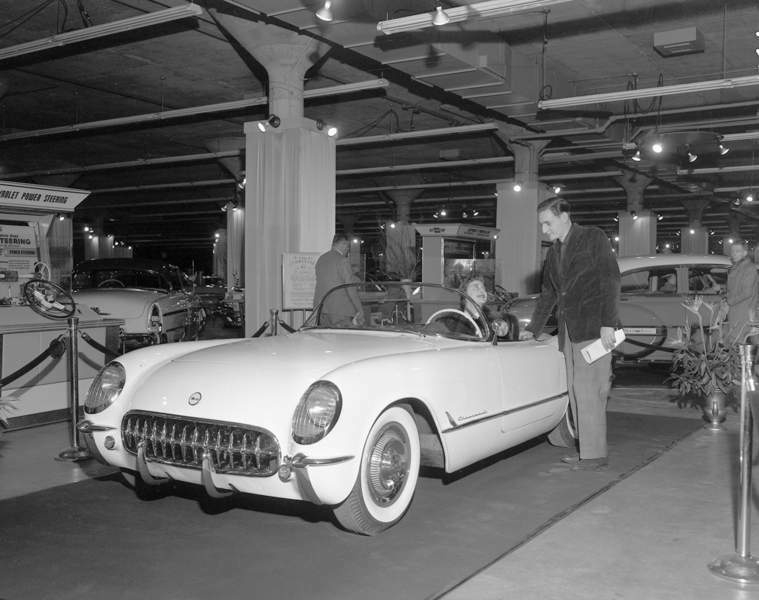 File March 3, 1954: A Corvette was on display at the 1954 Northeastern Indiana Automobile Show at Memorial Coliseum. 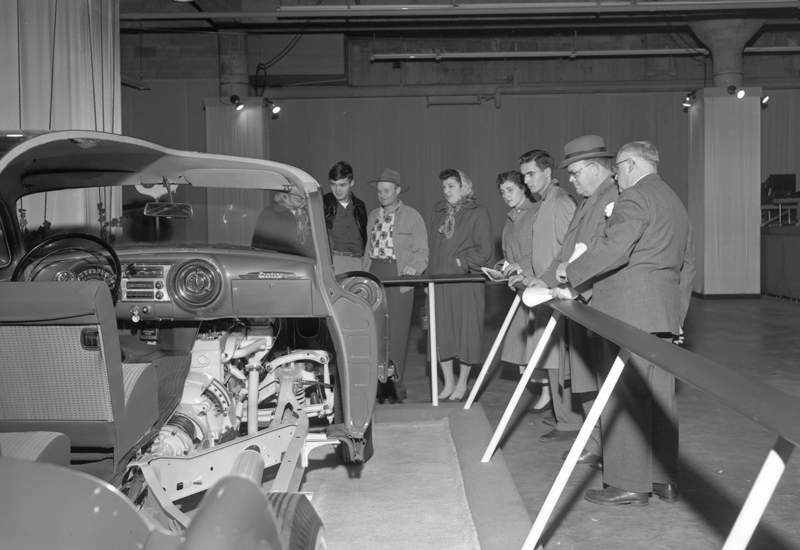 File March 3, 1954: Visitors take a look at the insides of a Pontiac at the 1954 Northeastern Indiana Automobile Show at Memorial Coliseum. 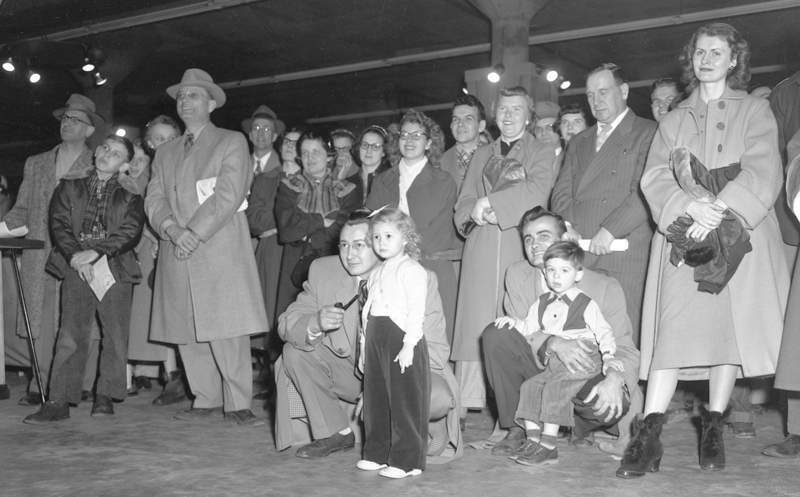 File March 3, 1954: The 1954 Northeastern Indiana Automobile Show at Memorial Coliseum featured cars, many of which were watched over by models. "I remember attending them with my family," he says. "I am particularly curious about the show in 1953 or 1954. I vaguely recall, and my mother used to remark about, the display of a 1954 Buick Skylark convertible parked at an angle such that the interior could be viewed as the car rotated around the turntable." He wonders if the display might have been connected to the Autorama car show conducted by General Motors around that time. Taking a look through The Journal Gazette's archive for late 1953 and early 1954, I found the Northeastern Indiana Automobile Show taking place in March 1954. It featured cars for the 1954 model-year, as well as experimental automobiles, a variety show with singing and dancing, and even a visit from Miss America. It ran March 3 to 7. The Journal Gazette published a 16-page preview section about the show, which was in its second year. Though there is a page featuring Buick's products at the show, no mention is made of the Skylark or a special display. Do you remember the display? Drop me a line! I'd love to hear more about it and share any new details with Fred. Included here are some photos from the 1954 Northeastern Indiana Automobile Show at Memorial Coliseum, a PDF of the 16-page preview section and a story about the first night of the show. To comment or make suggestions for History Journal items, email Corey McMaken at cmcmaken@jg.net or call 461-8475. 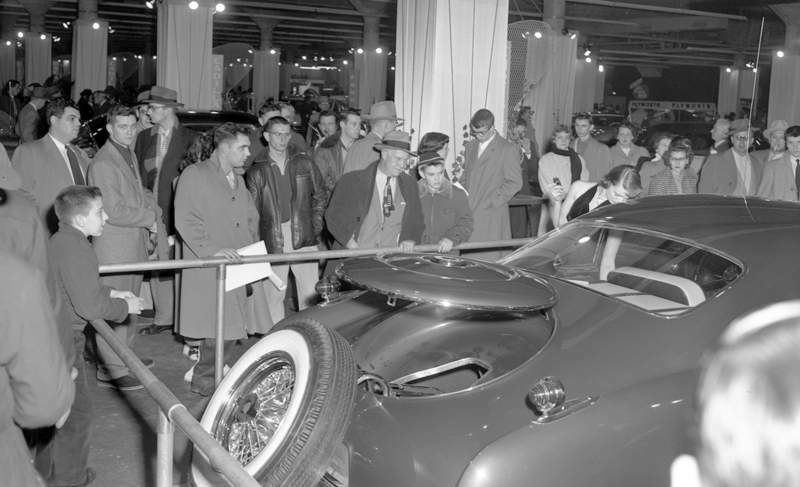 More than 2,500 hardy souls braved bitter temperatures and icy streets last night to be on hand for the opening of the 1954 edition of the Northeastern Indiana Automobile Show in Memorial Coliseum. Their praise for the show and their happy expressions proved they were glad to have braved the weather and were in no hurry whatsoever to depart. This show is bigger and better than the first one sponsored by the Fort Wayne Auto Trade Association, a year ago; it has many added attractions, both automotive and non-automotive. Chief among the non-automotive interests is the big variety show that is playing twice nightly on a huge, specially constructed stage at one end of the Grand Exhibit Hall. The show made its Coliseum debut at about 7:30 last night – the first show is regularly scheduled at 7, the second at 9 – to a crowd of about 1,500. The audience had to stand throughout the show, which lasted just short of an hour, but very few persons wandered away before it ended. Chairs will be in by today's opening. Sparking the show is Ken Griffin, well known organist who drew instant applause with "You Can't be True, Dear," his famous recording, as he closed his portion of the show. Griffin presented several numbers. Johnny Matson, who plays the accordion and trumpet separately and at the same time, was the favorite of the audience. Matson, a good musician, was particularly appreciated by a curly-headed little girl in a green snowsuit who was sitting on the floor below the stage. As he went into "McNamara's Band," he grinned at her broadly, and the child, delighted, exclaimed, "Daddy, he smiled at me!" Two duos, the dancing Kit Kats and Woodie and Corraine, open and close the show, respectively. The Kit Kats last night furnished some mighty fancy footwork to get the show off to a good start. Woodie skates intricately on a small part of the stage and swings Lorraine around rather dangerously. The Royal Aires, three men and a girl, sang medleys from "Oklahoma" and "South Pacific" and other numbers well suited to their voices with ease and good effect. Billy Grant is master-of-ceremonies for the show and the man responsible for keeping it fast-paced. He also appears in his own comedy routine. The whole show is well rounded and well costumed. Another non-automotive star is Miss America of 1954, lovely and charming Miss Evelyn Margaret Ay of Ephrata, Pa. The tall beauty made her first appearance at the show last night as she greeted visitors; she also will be at the show today. The experimental and sports cars were of high interest to last night's spectators. Included are the Chevrolet Corvette, one of the most talked-about production models of the year; the Pontiac Bonneville Special, a last-minute arrival with a Plexiglass "bubble top"; Packard's sleek fiberglass Panther and the three Chrysler Corp. "idea" cars – the Chrysler D'Elegance, the Dodge Firearrow and the DeSota Adventurer. Of course, most of the visitors really were there to see the shiny 1954 models from the 15 manufacturers participating in the show. Visitors were invited to climb in and out of cars, examine upholsteries and finishes and cut-away engine models and ask all the questions they wanted. All the exhibits are staffed with automotive cars on display and many have pretty girls, too, how look even prettier beside the cars. There are also two locally built sports cars, trucks, tires and all types of automotive accessories and a number of demonstration exhibits such as power steering. If you should want to talk about prices, that's all right too, but you're perfectly free just to look. A safety theater has been set up by the Safety Council in cooperation with the sheriff and state and local police. Safety movies are being shown continuously in the safety booth with one made mostly in Fort Wayne featured. It's "League of Frightened Men," a brand new color production by Galbreath Picture Productions, that tells the safety story in an interesting, effective manner. The Auto Show will continue in the Coliseum through Sunday, opening at noon daily and closing at 11 p.m.